Hello, hello, hello! Meet frenetically helpful Squirrel and his patient animal friends in four funny, engaging stories for the early chapter-book crowd. Squirrel is a very, very, very good helper! He helps his tree grow, he helps the river flow, and he helps his three best friends, Mouse, Turtle, and Rabbit. He is such a good helper, in fact, that he helps his friends when they don’t even know they need help! It is a lot of work being such a caring squirrel, but there is much to do before sleep, sleep, sleep time. Prepare to fall in love with the utterly endearing — and undeniably exhausting — Squirrel in this sweet and funny chapter book from author Lisa Moser and illustrator Valeri Gorbachev. Lisa Moser is the author of THE MONSTER IN THE BACKPACK, illustrated by Noah Z. Jones. She says she got the idea for this story by watching a squirrel scamper, scamper, scamper around her backyard. She and her family live in Grafton, Wisconsin. Valeri Gorbachev is the author and illustrator of many acclaimed children’s books, including ALL FOR PIE, PIE FOR ALL by David Martin. He lives in Brooklyn, New York. 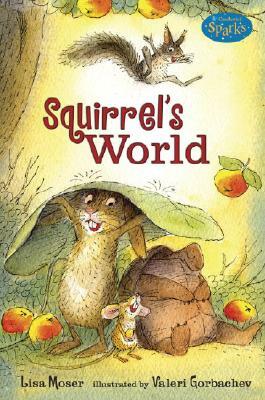 Repetitive text and well-designed pages support the efforts of young readers who will likely enjoy Squirrel’s humorous misadventures and his unique way of talking. Will charm and challenge emergent readers.